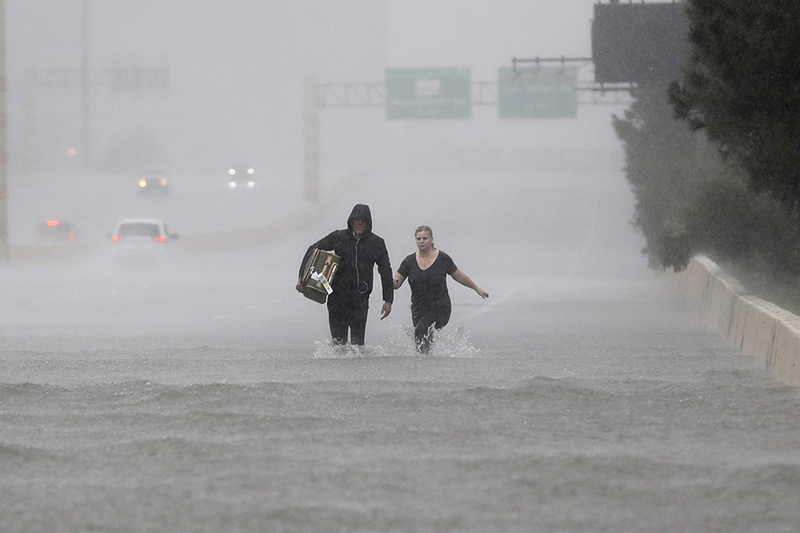 Two people wade through floodwaters on Interstate 610 in Houston, Texas, on Sunday. A team of Billy Graham Rapid Response Team (RRT) chaplains is ministering to Texas residents after Hurricane Harvey hit hard on Friday night. At least five people have died as of Monday, with the death toll expected to rise. The storm continues to threaten many areas, including Houston, as torrential downpours lead to dangerous flooding. FEMA Administrator Brock Long has said this is likely the worst disaster Texas has ever seen. The first wave of RRT chaplains—who are from Texas, California, Virginia and North Carolina—are joining Samaritan’s Purse disaster relief ministry, which has also deployed to the Gulf Coast to offer help to residents in crisis. The team of seven chaplains are set up at Faith Family Church in Victoria and will minister to people getting supplies at a distribution center there on Monday. An email alert has gone out to the Rapid Response Team’s network of 2,300-plus crisis-trained chaplains, asking them to pray for the people of the Gulf Coast and to let the ministry know their availability for the next few weeks. 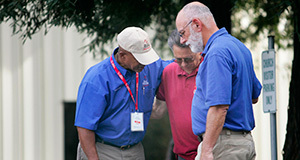 After Hurricane Katrina in 2005, the RRT had 95 chaplains ministering in one week, just in New Orleans—one of 16 deployment sites across eight states. Since many areas are expected to be flooded for days, chaplains are initially focusing on ministering at evacuation centers. As they have done in the aftermath of Hurricane Katrina, Superstorm Sandy and dozens of other natural disasters around the world, chaplains will offer emotional and spiritual care to people who are struggling. “We see this as an opportunity to demonstrate God’s love and care for people, for them to know that God hasn’t forgotten them,” said Jack Munday, international director of the RRT. On Sunday, the full extent of the damage from Harvey’s landfall was still unknown, and meteorologists warned that the threat of dangerous, widespread flooding would continue for several days. “Whichever way you look at it, it looks like a lot of flooding, a lot of broken dreams,” Munday said. As chaplains minister to individuals and families, they’ll also come alongside local churches to encourage and support them as they reach out to their communities. Whether they’re comforting a family that’s temporarily homeless or praying with a pastor whose church is flooded, the chaplains’ mission is to share love and hope—not a generic hope that will fade, but the lasting hope that is found through Jesus Christ.